Let's reveals six free ways to perform online tasks through speech rather than touch. Google's Voice Search feature lets you speed up web searches by speaking your search terms rather than typing them. 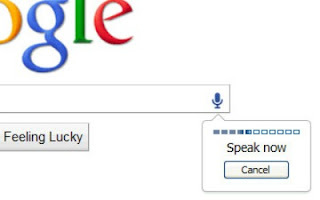 Just click the microphone icon in the search box and start talking to view instant results. You'll need to use Chrome and have a built-in or PC connected mic. 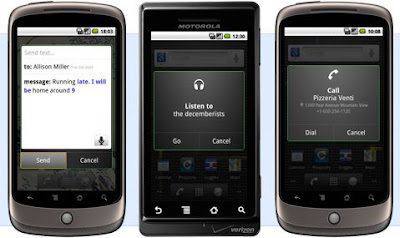 Voice Search is available for smartphones as an option in the Google Search app for Android, iPhone and BlackBerry, and also as a separate app for Android devices. Note that both the web and mobile versions of Voice Search are currently only available in US English, but this shouldn't cause problems for British users. 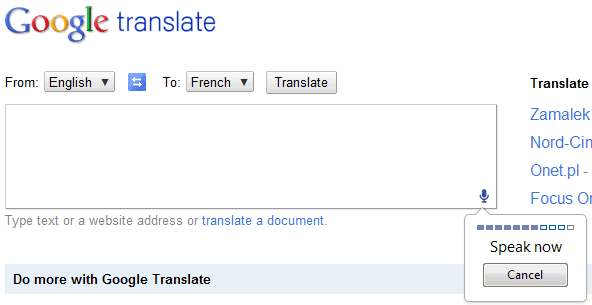 Google Translate now lets you speak the words you want to translate to and from dozens of foreign languages. 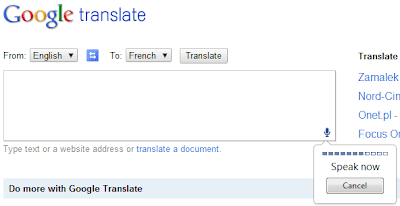 Select input and output languages from the drop-down menus, click the microphone icon in the bottom-left corner of the text box and then say the phrase to translate. With some languages, including Chinese, Japanese and Hindi, you can click the Listen (speaker) button to have the translation read back to you. The Voice Search app for Android features Voice Actions, which lets you perform various tasks without needing to touch your phone. For example, you can send a text message or email by saying aloud 'send text/email to [recipient] [message]'. For example 'send text to Daniel. Injured in car crash. Might be late'. Other clever voice commands include playing music by telling your device ' listen to [artist/song/album]'; getting directions by asking 'navigate to [address/ postcode/ business name]'; and opening websites by saying 'go to [website]'. 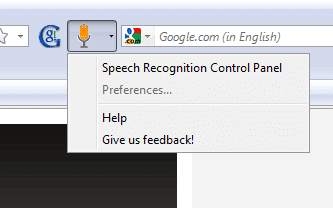 The browser add-on Firesay lets you perform several common web tasks using your voice. You can open websites by simply saying, for example, 'Browser go to Facebook', and use other voice commands to search for videos on YouTube and visit random sites through StumbleUpon. There are also two hands-free Firesay web apps, one of which finds and reads recipes, and another that takes photos with your webcam when you say 'Firesay cheese!'. Firesay currently only works with Chrome on Windows 7 and Vista, but there are plans to expand it to more browsers and platforms soon. VoxCommando finds and plays songs and videos without you needing to touch your keyboard. 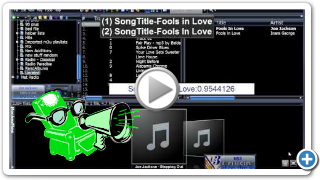 It works with a variety of media players including iTunes, Media Monkey and Windows Media Center, and will also open programs, perform web searches, and dial Skype contacts. Note that the free version of VoxCommando (for Windows 7 and Vista only) limits you to 25 voice commands before it needs to be restarted. You can upgrade to the paid-for product for $25 (about £15.80). A hidden feature in Opera lets you control the browser using your voice. 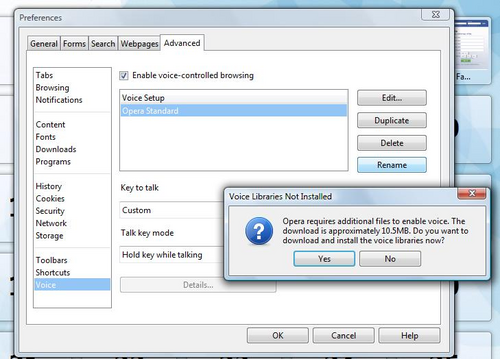 To turn on this option, go to Settings, Preferences, Advanced and select 'Enable voice-controlled browsing'. Choose which key to use to start talking (by default, this is Scroll Lock) and whether you need to hold it down or just press it once. Click Edit to view the full list of voice commands, which let you navigate web pages, reply to email and much more. 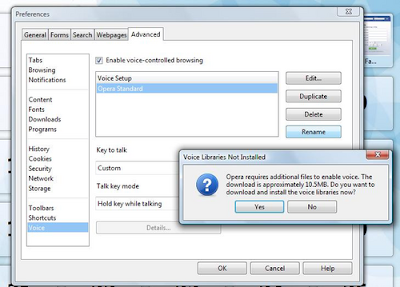 Note that voice control only works on Windows XP and 2000.